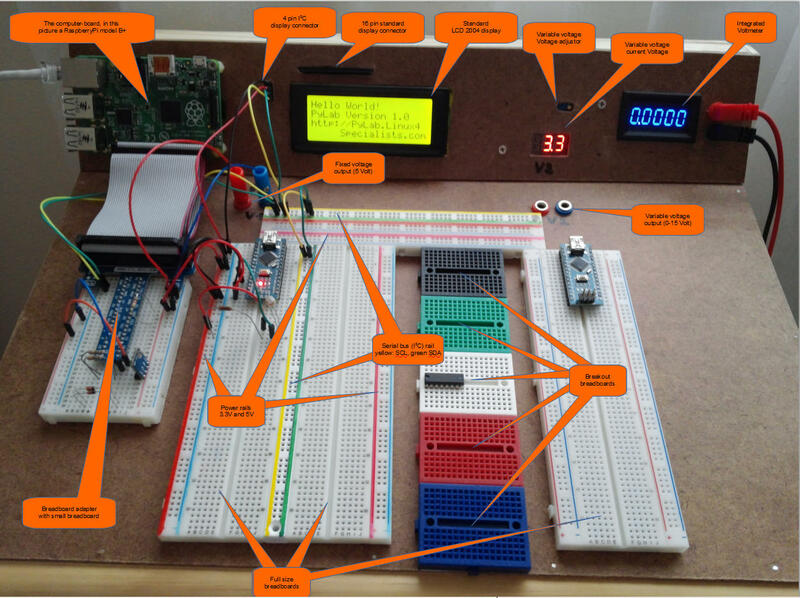 The PyLab: Why would somebody build his own electronic laboratory? Wires became unplugged from the breadboards. The I2C interface of one of my RaspberryPi boards was destroyed. 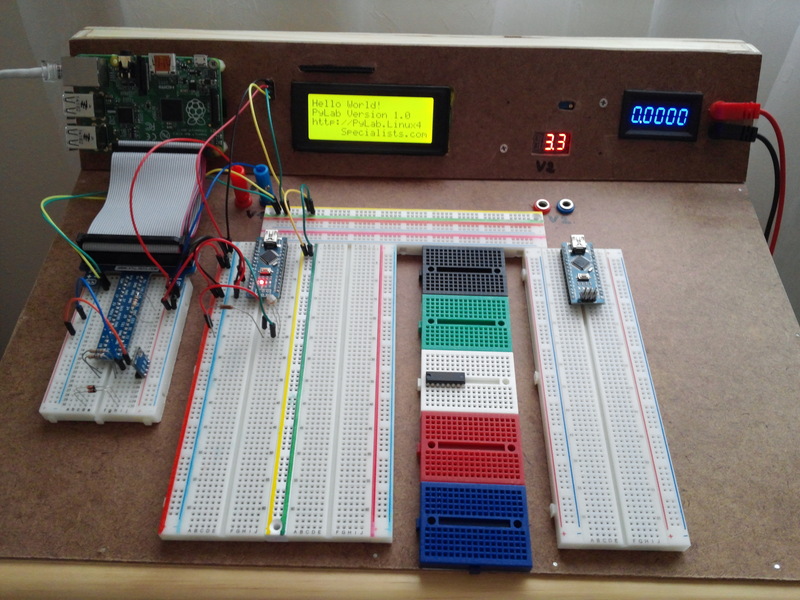 A better solution than a collection of loose breadboards (see the picture at the right) with a USB power-supply was necessary! I looked around at the usual shopping websites but could not find any kind of electronic laboratory that would fit my needs and would be affordable. All i found was either useless for my purpose, too specialized or way too expensive, like the Design Labs from Jameco. So with nothing readily available in the market i decided to make my own lab. Finding the right enclosure for my project turned out to be next challenge: I wanted a console like enclosure with two slopes, the first at a steeper angle to mount the computer board, the LCD-display, the Voltmeter and other display things and the second one as my workspace holding the breadboards. The only manufacturer offering such a design is Retex with the ABox, but those are expensive, a little too small and very hard to buy in the U.S. - Once again i had to make my own. You can see the result of all my work on the pictures below, click on the picture to see it full size. 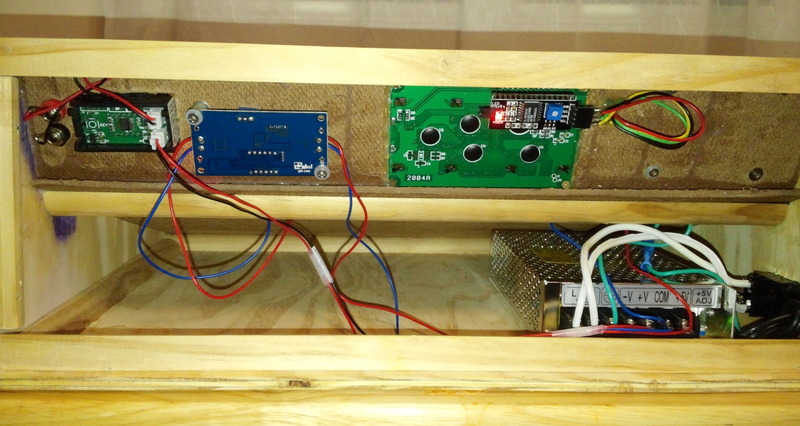 If you are curious how i made the enclosure and what's installed inside, just scroll down this page or follow the links. As said: Unable to find the right enclosure i decided to make my own. The first step was a quick trip to the nearest home improvement store, trying to buy some scrap wood. 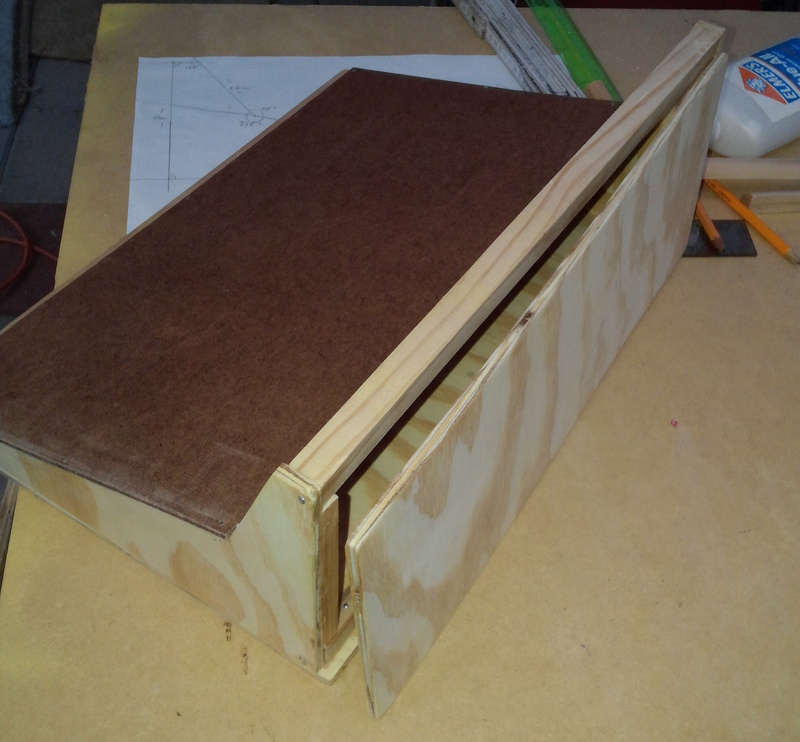 I had a really lucky day and got a piece of 9mm (11/32") plywood about 50x90cm (19.5"x35.5") in size for just $0.70, a piece of hardboard, sized 30x90cm (12"x35.5") for the same price and a couple strips of quarter round moulding were for free. 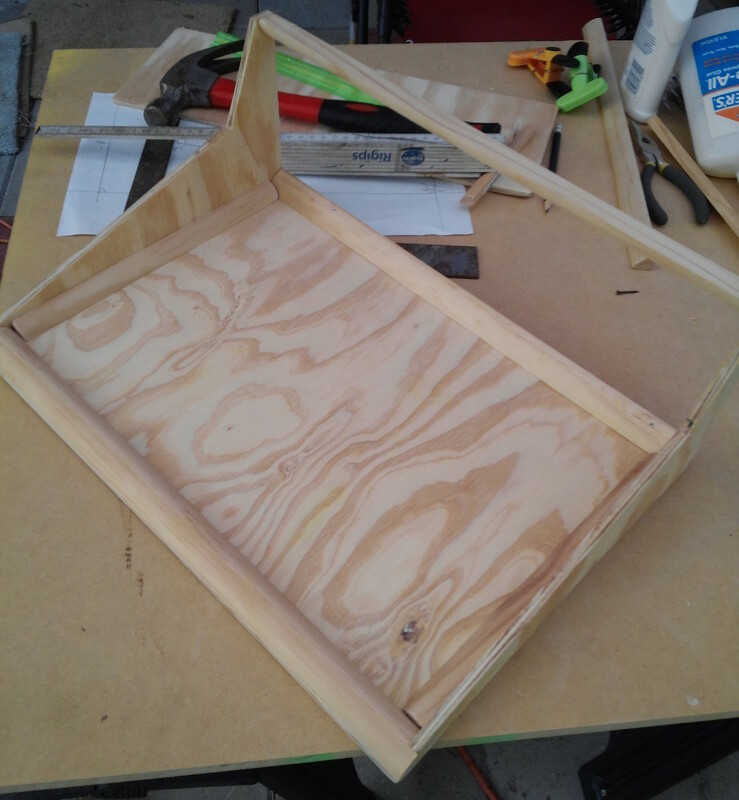 Back home i constructed the frame of the enclosure out of the plywood, the moulding strips, some nails and a bottle of glue. The result can be seen in the left picture below - no comments about my woodworking skills please: I am not a carpenter, i am a software developer. And yes: All fingers are still attached to my hands. 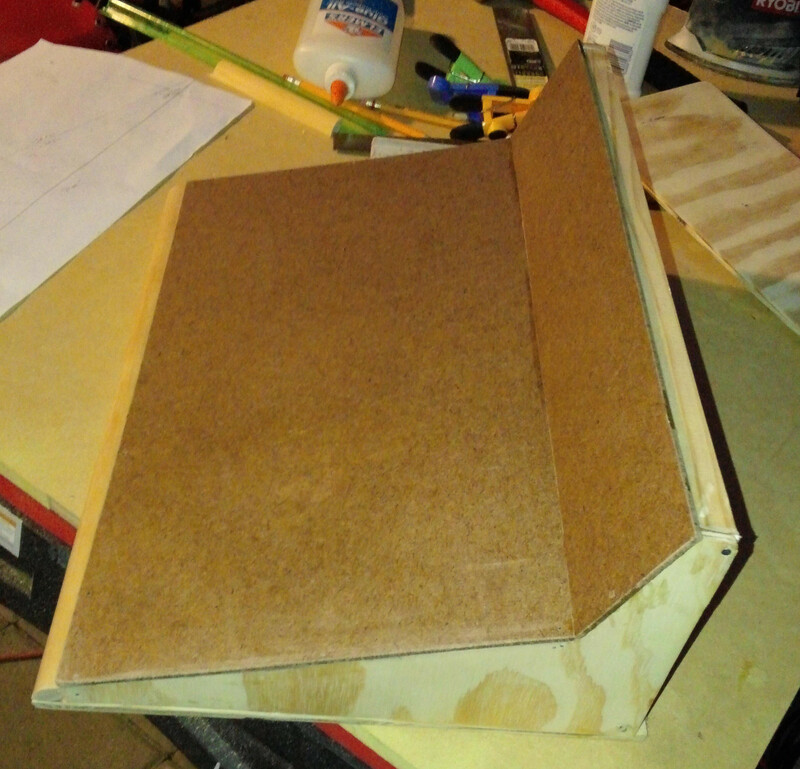 No need to cut holes into the back-cover, so it is made from plywood, as you can see in the last picture. 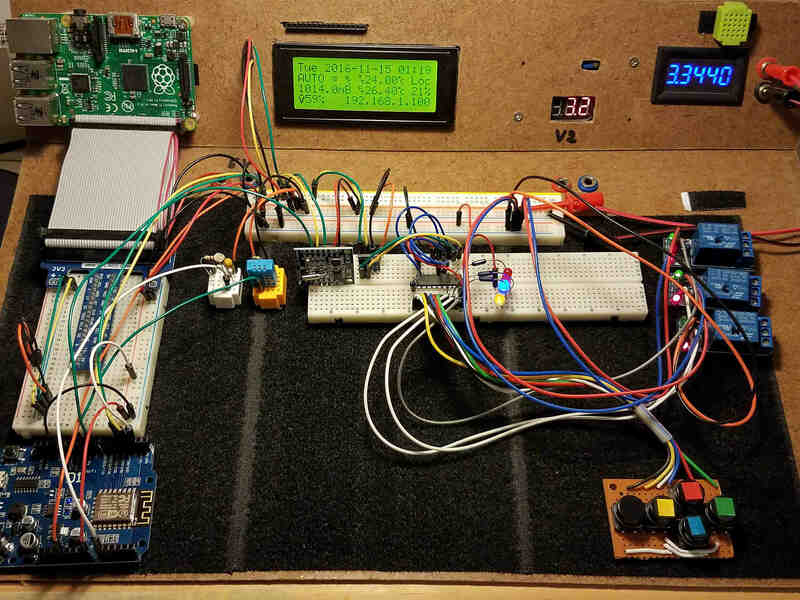 No electronics lab without some basic ingredients: I need a short circuit-proof power-supply providing a fixed Voltage of 5 Volts and a variable Voltage for which i use a step-down-converter, a standard LCD-display with an I2C-adapter and a Voltmeter. I bought all stuff from China and in larger quantities to obtain a better price per piece, which i always do for my projects. Some items i keep in stock to use them in future projects, other things i sell on my eBay-Page. 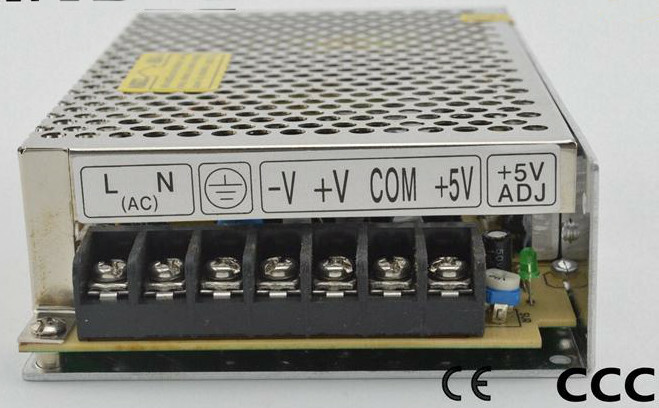 As a power supply i bought a triple output 60W AC/DC converter in the internet, providing +5, +15 and -15 Volts. Currently i don't use the -15 Volts, but who knows what i will develop in the future? Very Important: This device has a CE conformity marking, so it should be safe to use. Never use a power supply without a CE conformity marking! 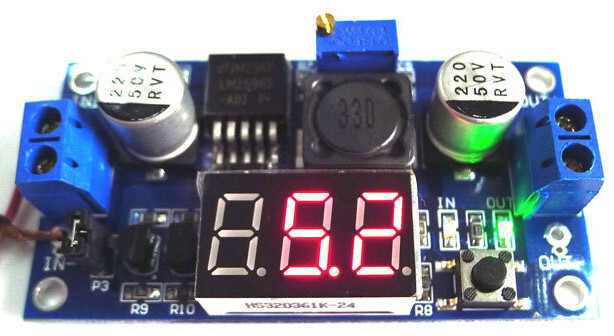 The 15 Volt output is connected to an adjustable DC/DC step-down converter module with LED voltage display which provides an adjustable Voltage between 1.2 and 14.2 Volts. Those converter modules are also available in the internet from China for very little money. For the Voltmeter i also used a ready made module from China, available in the internet for a few Dollars. I just had to connect the module to the 5 Volt supply on one side and to a set of banana-terminals on the other side. The module can measure DC-Voltage from 0-33 Volts, which is more than enough for my digital-lab, but it has one little disadvantage: It can only measure positive Voltages, when connected to a negative Voltage the display just shows 0.0000 . The LCD-display is a standard black on green LCD-2004 with four lines of twenty characters connected to a 16 female-Dupont-connector and one of the readily available I2C interface-adapters, based on the PC8574 chip. 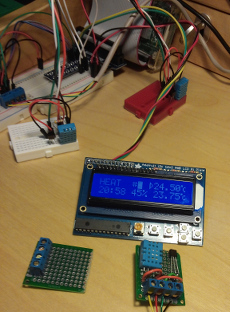 LCD-Displays and I2C-Adapters are also widely available in the internet, usually i buy them in large quantities, use them in future projects and sell some of them on eBay. 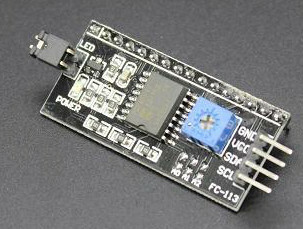 The DC/DC step-down converter module. The LCD 2004 display, with the I2C interface-adapter soldered to the back. The AC/DC converter at the bottom. One day, while browsing through the AliExpress web-site i stumbled over a shop selling the widest adhesive hook and loop tape i have ever seen: 12.5cm wide! 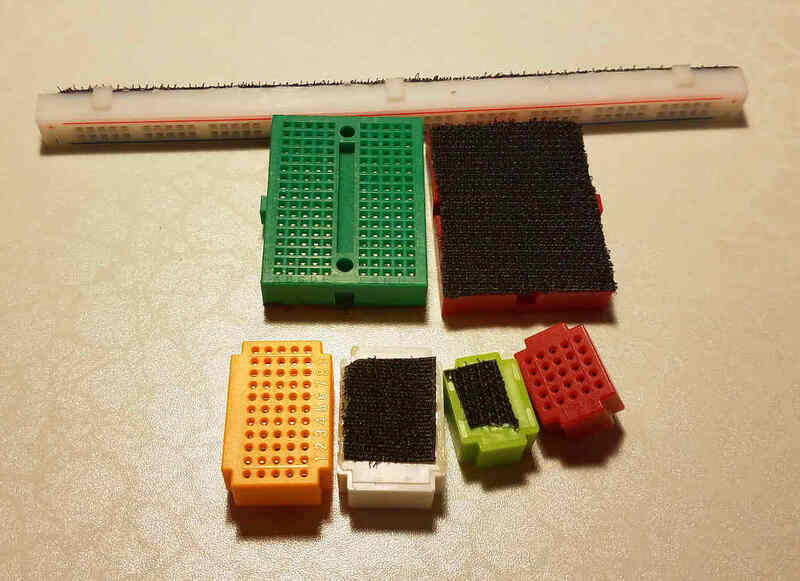 - Three strips of this stuff would cover the whole work-area of the PyLab, allowing to place breadboards and break-out modules freely where they would be needed. The pictures below show, from left to right, the PyLab work-area covered with thres strips of the loop-tape - don't use the hook-tape for this as it will hook in lint, hair and other dust bunnies. Adhere the hooked tape on the back of the breadboards and other modules, as the picture in the middle shows. 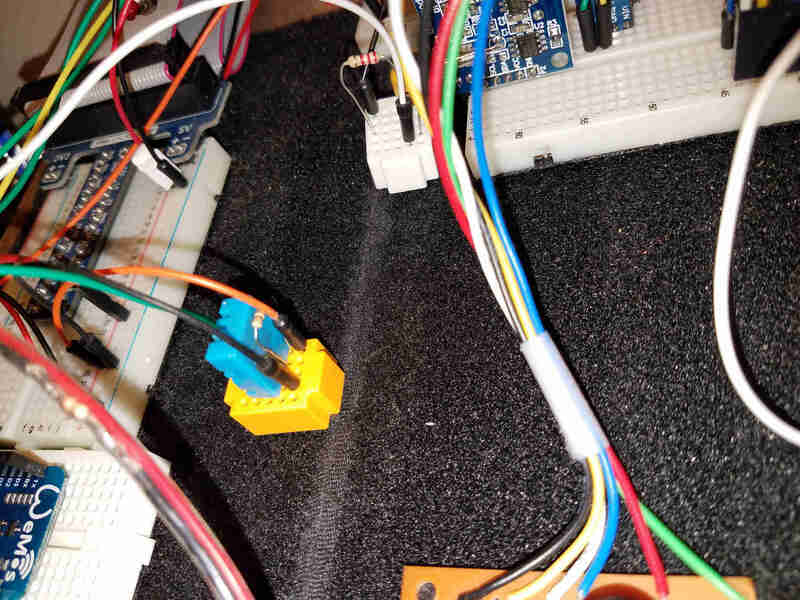 An example for a hand-made break-out module can be seen in the right picture below, just a simple combination of a DHT11-sensor with the pull-up resistor for the data-line.